As you may have heard by now, on Monday, two boys, ages 4 and 6, died at a sleepover when they were crushed by a 14-foot, 100-pound python. When the story first began hitting the news, my friends and I immediately got suspicious of what really happened. None of the earlier reported details made any sense. The man whose house the boys had been visiting claimed that the python had escaped from its cage in the exotic pet store (which he owned) underneath the apartment, that the python crawled into the ventilation system, punched a hole in the apartment wall, strangled the children, and then disappeared again without a sound. 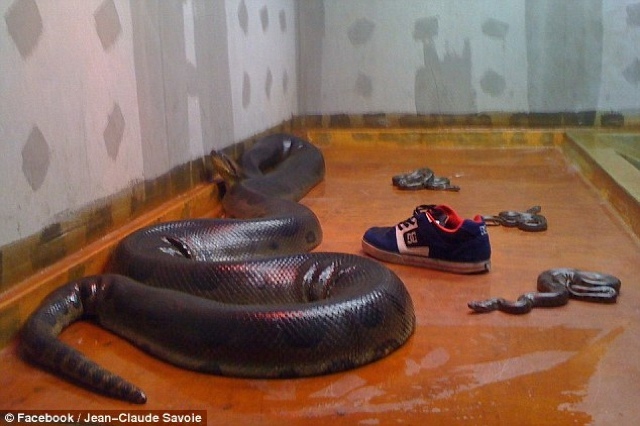 The owner allegedly found the snake in a corner after he discovered the boys had died. Something is just wrong there. Somehow we're supposed to believe that this snake broke off two locks [as were reportedly on all of the snake cages in the pet shop]... slithered into the HVAC system... made its way--all 100 pounds of it--through the HVAC system... punched a hole in the wall with its head somehow... made its way down to the boys... wrapped itself around both boys... strangled them... and then moved on? And no one woke up? Pop Culture Dad thought everything was believable except the alleged wall punching (particularly without disturbing anyone). My pals and I weren't so convinced. Even if you can believe all of the details surrounding the escape and reemergence in the apartment above, there's the problem of why would the python attack sleeping children simply to strangle them, but not do anything else? Pythons apparently attack in two circumstances: (1) when they feel provoked and (2) when they need to eat. It's unlikely that sleeping children would have made a snake feel threatened [though Pop Culture Dad did point out that if the wall punching did occur, the snake could have landed and freaked out. That I can believe]; and if the python moved on after strangling the children, it certainly wasn't trying to eat. Things that make you go hmmmm. My friends and I [ever the doubting lawyers] suspected some sort of foul play afoot. More importantly, though, it raised the issue for us: under what circumstances would you allow your child to sleepover at another child's house? Twin Mom (who was part of this Great Sleepover Debate) found this really interesting articles detailing "7 Reasons to Say No to Sleepovers." Many of the reasons revolved around lack of sleep and the effects of that. Those reasons I (along with the rest of my friends) found pretty weak. Who are these parents having and allowing school-day slumber parties?? There was also a reason related to "Awkward Social Situations," which is apparently what happens when you're okay with one kid sleeping over or your kid going to someone's house, but other kids or other houses are banned, and you don't want to explain to the parents why. See... I don't have that issue. If my kid isn't allowed to go to your house alone, she's not. And if you expect me to step out of my comfort zone to avoid offending you, then that type of parenting actually just justifies my not sending my kid to your house. My children and their safety are the most important things to me--damn your comfort level. I really don't care. Nope, not socially awkward for me at all. There were some valid points, too, which generally boil down to "things that you don't let happen in your own house will happen somewhere else." Those to me are the most valid reasons. In fact, the only valid ones. And that is perhaps why, when my kids get old enough that we're both comfortable with the idea of them having sleepovers, the list of families in that "approved sleepover" rotation is going to be very narrow and tight--like the VIP room at a very exclusive club. I had plenty of sleepovers as a child and teen. I recall going to my first sleepover party in fourth grade. We saw [I'm dating myself here] Breakin' 2: Electric Bugaloo at the theater and then had an all-girl sleepover where my friend's (we thought at the time) super cool sister who was in (gasp!) high school made us all pancakes the next morning. My cousin (who was my best friend) and I slept over at each other's houses all the time from elementary school through high school. I even had one co-ed sleepover [which I recall both my mom and I finding very odd] in middle school. Twin Mom and I had tons of sleepovers in high school--as she said, we would usually go to her house to eat, because there was actually food, but then my house to hang out, because we could pretty much do whatever we want [which, really, for us geeky girls was just staying up all night talking, singing, and playing on the computer]. The landscape has changed since the 1980s and 1990s, though. I cannot imagine letting my girls sleepover at anyone's house unless I knew the parents really well and knew all of the kids who would be present. I would also have to lack the gut feeling that someone in that house is creepy [always trust your gut, even when it makes you feel guilty]. I used to think that the only pets I would wonder about are dogs and cats, because of how highly allergic Little Diva is to pretty much anything with fur... but now... Well... I think I'm going to need an inventory of every animal in the house or with reasonable (or unreasonable) access to the house; because a few hives and couple of swollen eyelids from exposure to a Cocker Spaniel seems pretty mild in comparison to Death-by-Python. And what about guns?? I live in Texas, the Concealed Handgun Capital of the World. Even though I grew up around guns, I hate them, they terrify me, and I'm smart enough to know that statistically, we are more likely to be killed by our own gun than we would gain protection from it. So we don't allow guns in my house. Period. Even my parents know that if they are in my home, the gun stays in the car. And Nonna has always been expressly instructed that the Pop Culture Girls are not allowed to be in her car if the gun is there [we don't have that issue with my dad, who drives a two-seater convertible the girls would not be even able to legally ride in for another nine years]. Considering the types of precautions I take with my own parents, why in the world would I just let my children go to a house with some random gun owner, particularly when I don't know what kind of precautions the parents take with securing their guns and, quite frankly, I don't trust most gun owners to actually be as responsible with their guns. So, yeah... I think I'm going to need a questionnaire before my kids can go to a slumber party. Or, ya know, just have a blanket rule that their social calendar is based on my intimate knowledge and understanding of the household, and anything that doesn't pass mom's smell test and thirty-point inspection is not getting approved. As for those poor little boys in Canada... the Lawyer Guts were totally right. Reports came out today that this python had not escaped from the pet store in the amazing (and completely full of crap) story that the pet store owner expected everyone to buy. Nope. This snake was already in the apartment... in a glass cage... without a proper lock... and it wasn't the first time it had gotten out. Others who had seen the snake before described it as aggressive and unused to people. The boys had played with a variety of animals that day, meaning they likely had the smell of snake-food on them. The pet store owner was known for his very lax approach to safety with these dangerous creatures. This was a very tragic and 100% avoidable event. It's notentirely the mom's fault for allowing her boys to stay at her friend's house, seeing as it was her friend who acted (and omitted) with the gross negligence and pure stupidity that eventually led to the boys' death. But perhaps mom should have [and I know she's beating herself up enough, so it's not like I have to do it for her] had a talk with her (dumb) friend about putting his pets away safely before she turned over her most precious belongings to him? Maybe she did? And maybe he lied to her like he (apparently) did to the police and the media. I honestly don't know what happened there. But I do know that my kids will not be sleeping at any house over an exotic pet store or with any exotic/killer animals lurking around. I don't care who the parents are. I'm so, so glad that my littles aren't at the sleepover stage yet. And the "pet shop owner" needs to be sent straight to prison.